In this problem set students construct a P-T phase diagram for the aluminosilicate polymorphs based on experimental phase equilibria and application of the Clausius-Clapeyron equation. The problem set uses unit cell volume, molar entropy, and phase equilibrium data culled from the primary literature. It leads students through the exercise in step-by-step fashion starting with a brief explanation of the Clausius-Clapeyron equation. 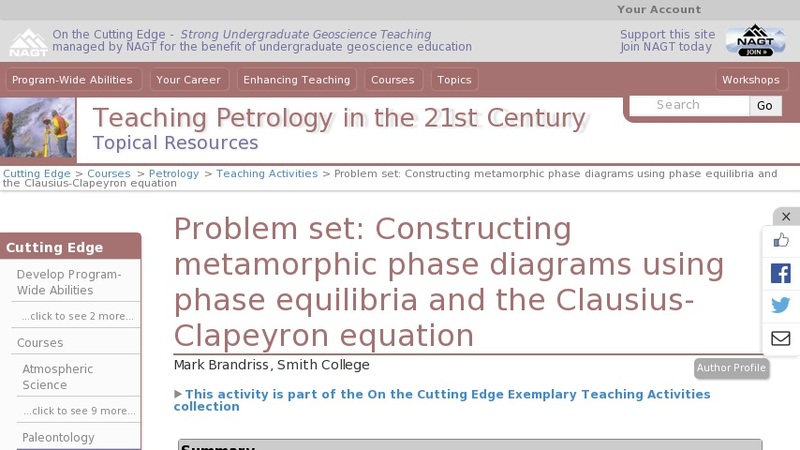 The main goals are to help students understand how thermodynamics can be useful for solving real geologic problems, to provide some insights into the nature and construction of P-T phase diagrams, and to provide experience in dealing quantitatively with real data.